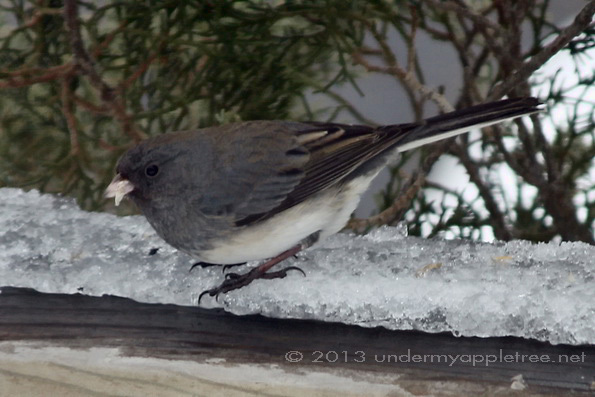 Almost wordless: The little Dark-eyed Juncos visit my yard every winter when they migrate south from Canada. They actually look happy hopping around in the snow. Me, if I had wings, I’d keep flying right on down to Florida! I’m with you! I’m already tired of the cold weather. Juncos and Chickadees always make me smile! Me too. And I love that the Chickadees still sing their dee-dee-dee song even in the winter when all the other birds go silent. They are such friendly little birds. They come right up to the door and perch on the deck railing so it’s easy to photograph them in the winter. I always worried about their little bare feet too but I’m told the feet don’t feel the cold, kinda like our finger nails. to be honest, I think only the presence of cute juncos on my lawn makes me survive winter and the snow I hate. This year for the first time, I see them fly up to the goldfinch feeder! and oh by the way, we have another regular visitor at the suet packs this year, a red-bellied woodpecker, usually only hairy and downy ones. much fun!